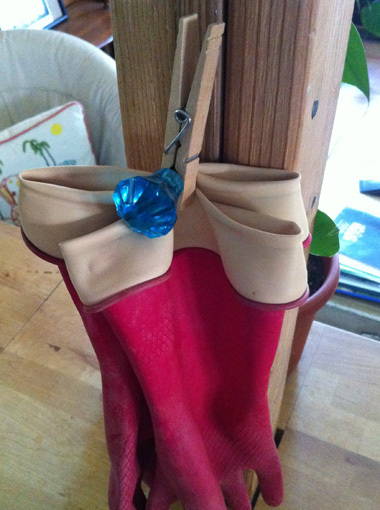 This hip trick comes to us courtesy of Paula over at Springdale Farm, not too far from my house in East Austin. I was recently in Paula’s kitchen for the Austin Food Blogger Alliance’s cookbook photo shoot and this little gem came to my attention. 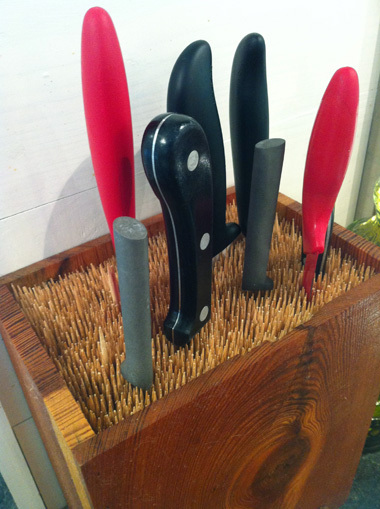 Paula told me about how their lovely knife block was an idea she saw in a magazine. They personalized the idea with a box that’s made from shiplap wood from their home’s renovation. Your box can be something personalized like this, or even a repurposed vintage container/jar you love filled with wood skewers. If your proposed knife block container is shorter than the skewers, just snip the skewers with a wire cutter and place them cut-side down in the container so they’re flush with the top. This hip trick comes to us from a very hip mama friend of mine. Andi told me about how she held onto a pretty swatch of vintage fabric for years before her babies were born. It now lives nestled taut inside three embroidery hoops in her twins’ room!